The particle is purported to be the means by which things in the Universe obtain their mass. 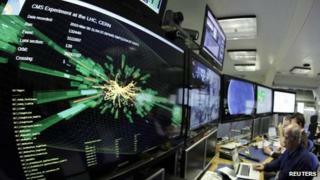 Two separate experiments at the LHC - Atlas and CMS - have been conducting independent searches for the Higgs. Because the Standard Model does not predict an exact mass for the Higgs, physicists have to use particle accelerators like the LHC to systematically look for it across a broad search area. At a seminar at Cern (the organisation that operates the LHC) on Tuesday, the heads of Atlas and CMS said they see "spikes" in their data at roughly the same mass: 124-125 gigaelectronvolts (GeV; this is about 130 times as heavy as the protons found in atomic nuclei). "The excess may be due to a fluctuation, but it could also be something more interesting. We cannot exclude anything at this stage," said Fabiola Gianotti, spokesperson for the Atlas experiment. Guido Tonelli, spokesperson for the CMS experiment, said: "The excess is most compatible with a Standard Model Higgs in the vicinity of 124 GeV and below, but the statistical significance is not large enough to say anything conclusive. "As of today, what we see is consistent either with a background fluctuation or with the presence of the boson." Prof Rolf-Dieter Heuer, director-general of Cern, told BBC News: "Such signals can come and go… Although there is correspondence between the two experiments, we need more solid numbers." None of the spikes seen by the experiments is at much more than the "two sigma" level of certainty. A level of "five sigma" is required to claim a discovery, meaning there is less than a one in a million chance the data spike is down to a statistical fluke. Another complicating factor is that these tantalising hints consist only of a handful of events among the billions of particle collisions analysed at the LHC. Prof Heuer said: "We can be misled by small numbers, so we need more statistics," but added: "It is exciting." If it exists, the Higgs is very short-lived, quickly decaying - or transforming - into more stable particles. There are several different ways this can happen, which provides scientists with different routes to search for the boson. They looked at particular decay routes for the Higgs that produce only a handful of events, but have the advantage of having less background noise in the data. This background noise consists of random combinations of events, some of which can look like Higgs decays. Other decay modes produce more events - which are better for statistical certainty - but also more background noise. Prof Heuer said physicists were "squeezed" between these two options. The simple fact that both Atlas and CMS seem to be seeing a data spike at the same mass has been enough to cause enormous excitement in the particle physics community. Have scientists at the LHC found the Higgs or not?